From the Baldwin County Courthouse, go east on Hancock St. and follow Highways 22/24 southeast for 4.4 miles. Where Highways 22 and 24 split, bear right on Highway 24. Go another 1.3 miles to County road 182 (unpaved). Turn left. Go 0.6 mile. The cemetery is on the right and is set back about 25 feet from the road. 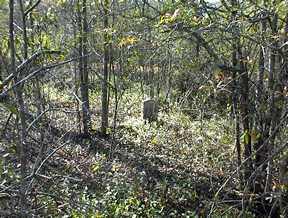 Some of the cemetery is in a small clearing; some is in the woods. Wounded in leg at Baker's Creek, Miss. Crumbling brick vaults and sandstone markers -- none of which have inscriptions. 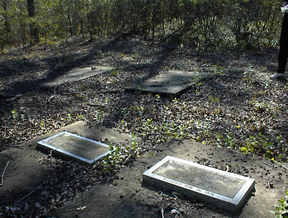 At least 10 depressions or graves in woods, on the Hwy 24 side of the cleared area. About 10 graves in the cleared area. Age 81. All info per obituary (attached). He is buried somewhere in this cemetery.